Mti Home Video Set to be "Closed for the Season"
Not the worst horror film I've ever seen but not for lack of trying. 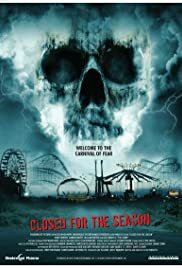 Being a long-time fan of horror movies as well as circus and carnival thrillers, I was looking forward to enjoying a feature combining the best of both worlds minus perhaps the extreme surrealism of Alex de la Iglesia's "The Last Circus". This one, unfortunately, failed to deliver at any level. Had I been shackled before the screen, I would have seriously considered chewing off a leg to escape the very real horror of a complete and utter waste of film stock. Here's hoping the wonderfully spooky atmosphere of Chippewa Lake Park will one day serve as locale for a well-executed and memorable fright film. Closed for the Season? Closed for a reason.